Prime Minister Narendra Modi, who is on a two-day visit to Iran, witnessed the signing of agreements and Memorandum of Understanding (MoU) between the two countries on 23 May along with Iranian President Hassan Rouhani. The landmark agreement on the Chabahar port was also signed in the presence of both the leaders. 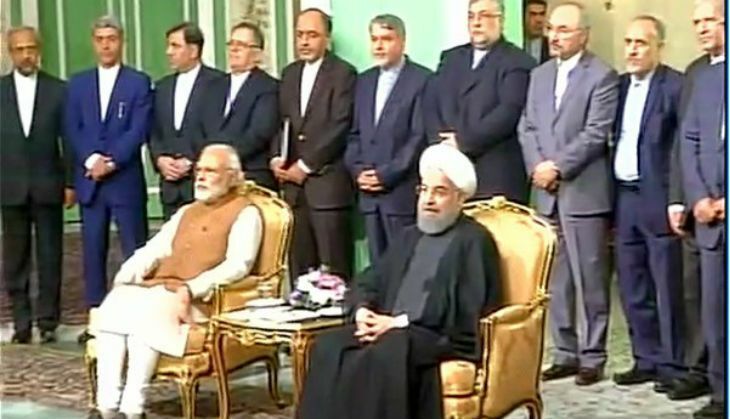 PM Modi and President Rouhani delivered the joint statement in Tehran. In the joint statement PM Modi, said that India and Iran were old friends. It will be a historic occasion. It'll open new routes for India, Iran and Afghanistan to connect among themselves. Later today we will sign a trilateral transport and transit agreement in partnership with India, Iran and Afghanistan. Outcomes and agreements signed today open a new chapter in our strategic partnership. Bilateral agreement to develop Chabahar port is an important milestone. India is to proud to have stood with people of Iran during your difficult times. We exchanged views on emerging regional challenges and global issues of common interest. Visiting Iran a great privilege for me. India and Iran are not new friends. Our 'Dosti' is as old as history. Economic relationship between the two countries can become much bigger compared to the past. Considering that both countries have an important port like Chabahar, we can have vast cooperation. Chabahar port can serve as a point of connectivity between different countries, specially India and Afghanistan, also east of Europe-Iran. We made a decision to bring relations between our academics, universities, technology and scientific parts closer to each other. We discussed about tourism, also talked about courses in Hindi,Persian to be held in the two countries. We discussed how we can cooperate on intelligence sharing and how we can get closer to each other in our fight against terrorism.